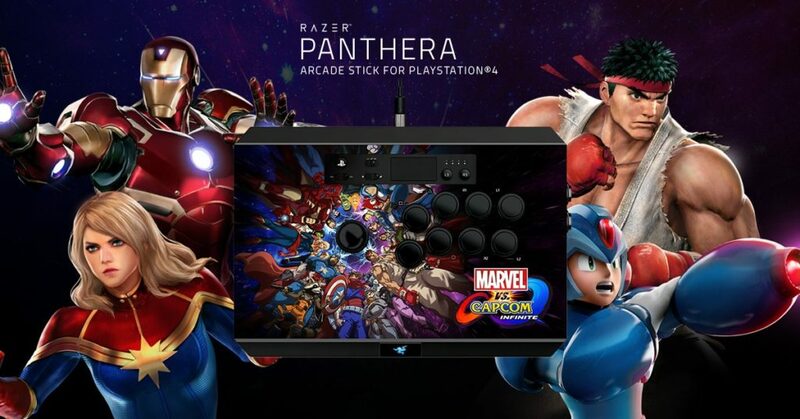 SAN FRANCISCO – Razer™, the leading global lifestyle brand for gamers, today announced a collaboration with Capcom and Marvel to produce a Razer Panthera arcade stick for “Marvel vs. Capcom®: Infinite” on the PlayStation™ 4. The high-quality fight stick for PlayStation 4 features original Marvel vs. Capcom themed artwork that pays homage to the beloved game franchise and universe. The controller was tested by some of the world’s best esports athletes, and it is customizable and constructed with competitive gamers and modders in mind. The special-edition Panthera is built with premium Sanwa hardware components: 10 buttons and an eight-way joystick. Competitors may customize the arcade stick to suit a variety of playstyles thanks to its modular construction. Internal storage compartments reveal dedicated slots for a detachable screw-lock cable, screwdriver and additional storage for two extra buttons. It also features a tournament gaming mode and compatibility with major fighting games. For more information on the Marvel vs. Capcom Panthera Arcade Stick by Razer, interested parties may go to www.razer.com/panthera-mvci.